Carnations express an array of emotions and symbolise many different things depending on their color. Therefore a mixture of multi color carnations can express a variety of feelings. For example if you want to express feelings of deep love and respect, and also be capricious at the same time, then a multi color carnation bouquet with red and purple carnations would be ideal. And if you want to put a pretty combination of flowers together without intending an underlying meaning, then multi color carnation make a spectacular arrangement. Arranging Multi Color Carnations: The National Flower of Spain and the birth flower of those born in January, pink carnations are hailed as the symbol of a mothers love and the emblem of Mothers day. Carnations are among the most popular flowers in the world, as these versatile flowers are hardy can last up to 14 days if properly cared for. When arranging your bright carnation bouquet, just trim the stems and place the flowers in a vase mixing them with greens. Your carnations can be manipulated to look very elegant, by massing them together in a tight bunch. Carnations are great flowers for Pave style flower arrangements. 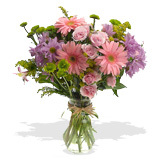 Multi Color Carnation Bouquet Care Tips: Your multi carnations bouquet has an estimated vase life of 7-14 days. Carnations are relatively hardy flowers compared to other flower types, and can last as long as 14 days, with just a little care. When re-cutting your carnation stems, cut just above one of the nodes that run up the flower's stalk. This will allow the stems to draw water more easily. After remove the foliage that falls below the water line, place your carnations in our vase with luke warm water mixed with the first packet of flower food. Follow these simple care tips and enjoy your multi colored carnation bouquet for days to come.